Rental Service Company in Monroe, LA | Ram Rent-All, Inc.
Ram Rent-All, Inc. has been your local source for all things equipment rental in Monroe, Louisiana since 1981. From specialized equipment for landscaping to heavy equipment for construction work, we serve a wide range of needs by supplying quality rental items, saving you the burden of full purchase costs. If you’re looking for a reliable source for equipment rental in Monroe, LA, look no further! Ram Rent-All, Inc. has been serving people in need of rental supplies in Monroe, LA for more than 30 years, with a long history of satisfied customers to show for it. If you’re getting ready to do some heavy duty landscaping in your backyard, we’re ready to supply you with the necessary equipment to get the job done. 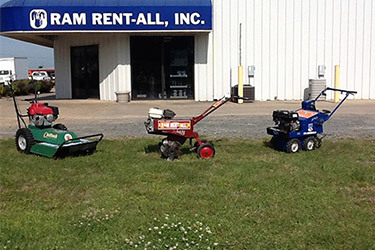 We here at Ram Rent-All in Monroe, LA know that purchasing your own tractors, tools, and other costly, one-time use items is an unnecessary expense—save some money and still get the job done with help from our quality equipment rental service in Monroe, LA! We have been serving the equipment rental needs of people since 1981. We proudly serve the Monroe area. Our rental inventory is vast and encompassing for your convenience. We have a Ram Rental blog in Monroe, LA to keep you up to date on all the latest rental equipment options that we offer and how to make the most of your rental. We are a member of the American Rental Association and the Louisiana Rental Association. Whatever your needs for equipment rentals may be, you can put your trust in our professionals—we’re here to supply you with fast, reliable and affordable products.